From a simple, coloured design to something with a variety of intricate details, there is no limit to our creativity here at Allenby Glass. Based in Lincoln, Lincolnshire, we specialise in a full range of bevelled and lead products including bespoke glass. 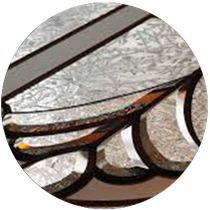 Our in-house experts offer glass designs and unique masterpieces that add that extra touch of class to your windows or doors. Contact us in Lincoln, Lincolnshire, to obtain more details about our bespoke glass and glass designs. Using a beautiful combination of lead and coloured films, we are able to create designs that enhance your home with a palette of delicate colours. 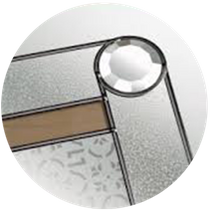 Our bespoke glass products add a charming touch to your conservatory and also focus your own character on your doors and windows. We also offer a selection of stunning Georgian units. 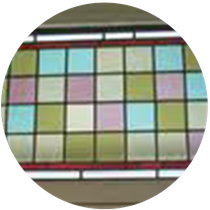 You are able to choose from clear or coloured bevelled glass designs to create windows and doors of distinction. Our elegant range uses 5mm glass multi-faceted pieces, clusters, and shapes that refract and reflect light. 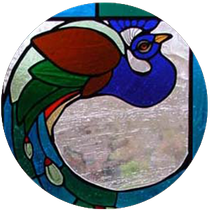 Delight in traditional stained glass with a modern twist from our business. Our glass pieces are handmade by fusing molten coloured glass together to create an eye-catching feature. With an extensive spectrum of colours to choose from, we are able to create unique designs that suit your style. Whether you would like to take several pieces from designs in our brochure or have an idea of your own, we are ready to assist you. Our talented in-house designer is more than happy to help you to bring your ideas to life.